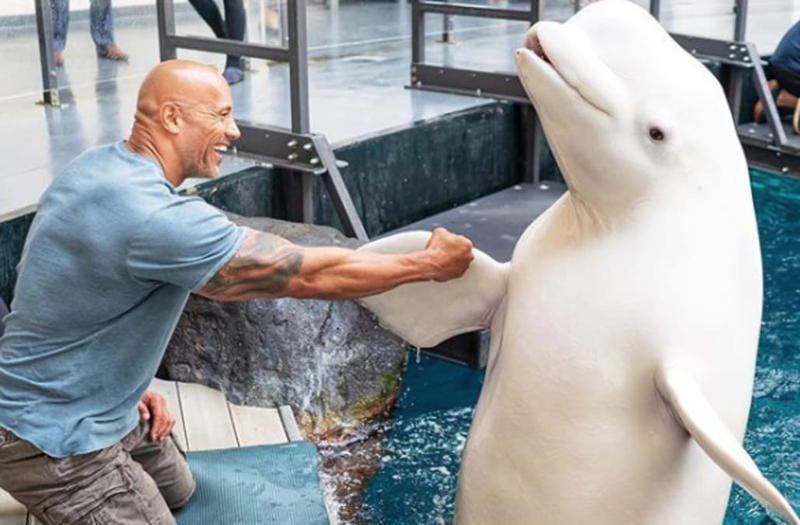 He’s one of the most likeable actors in Hollywood, but not even Dwayne “the Rock” Johnson can emerge from an aquarium unscathed. The Skyscraper star took his family — including girlfriend Lauren Hashian and 2-year-old daughter Jasmine — to the Georgia Aquarium over the weekend. Johnson shared photos from the trip on Instagram and gushed about the sea life on display. “More than 100,000 animals and sea creatures here that I’m in constant awe of,” he told fans. He also posed with a beluga whale and a seal. But his family outing didn’t sit well with animal rights supporters who object to aquariums, zoos, and parks like SeaWorld that keep animals in captivity. “This is sad,” added a commenter, who was one of many to use the anti-captivity hashtag #EmptyTheCages. Not all fans agreed, however. Many mocked the anti-aquarium backlash and accused critics of being overly sensitive. Others defended aquariums, claiming that they were harmless institutions and insisting that the animals born there wouldn’t survive in the wild. The 2013 documentary Blackfish — which took SeaWorld to task for its treatment of the now-deceased captive orca Tilikum — has been credited with reigniting concern about marine animals in captivity. The Georgia Aquarium, meanwhile, has faced scrutiny for the deaths of beluga whales in its possession. In November, the beluga whale Qinu lost her calf following complications during delivery. As the Atlanta Journal-Constitution reported, the animal rights organization In Defense of Animals ranked the Atlanta attraction as having the fourth-worst tanks for whales and dolphins in North America. The actor has yet to address the controversy and shared a new video from the trip Monday morning. Yahoo Entertainment has contacted his representative for comment.